It's time for another Paper Makeup Stamps Monday challenge (on a Wednesday!). Tina Hale issued a color challenge for this one...olive, ruby and chocolate. Lucious earthy, fall colors! I used Sprout for this because of the earthy colors...I thought she would look good in them. I started with my dp. I have a list of all the SU decorative papers and the colors that go with them (this is a year or so old now). It's so helpful, and sorry I don't know where I got it from...probably somewhere on SCS. Anyway, I came across Fall Flowers and Ginger Blossom (both retired). I chose the olive one from Fall Flowers and the ruby from Ginger Flowers. Then I went to my sketches (we all know I'm sketch challenged), and chose Beate's Weekend Sketch. I added the flowers, and I had to color the red one with my copic marker because I didn't have one to match. The sentiment is also from PMS. If you want to see what the other DT members have done, go to the PMS blog. You can also post your card to Mr. Linky there...we'd love to see what you do with these colors. 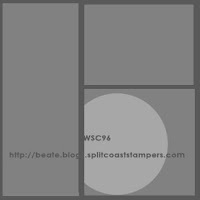 If you post to SCS/PCP, use the keyword PMSMC29. Also, sneak peeks for the PMS October release will begin on Friday, October 2 (I cannot believe it's almost October already!). Be on the lookout for that...lots of great new images being released! Thanks for stopping in today! Have a great week! Hey everyone! Today is Tuesday and it's time for another Think INK Tuesday challenge from Artful INKables! And I've chosen the challenge today! If you know me, you know that almost all my cards have some sort of ***sparkle*** on them, cause I love when cards shimmer in the light! So my challenge is to make your cards ***sparkle***! 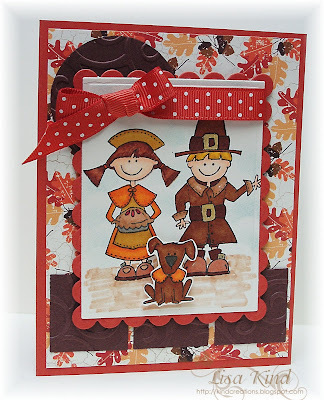 Go to the Artful INKables blog and check out my card and all the details! I hope you join in our challenge. You'll see my card posted here on Thursday as well! Happy Saturday, everyone! The My Time challenge that Lauren gave us today is to create a package for candy. I made the package, but I have to confess that I didn't buy the candy for it...I've lost some weight recently and I do not have the will power to NOT eat the candy if it's in my house! I bought some candy as a prop for another project I did a couple of weeks ago and ate the WHOLE BAG!!! So no candy for this project! Please just pretend it's inside! I used Lauren's Tucked Away template for this. Imagine all the pretty candy that would fit inside! The base of the box is so saffron and the dp is SU's Pawsitively Prints (from the Holiday Mini). I just love that soft gingham print. The ribbon is also so saffron grosgrain. Now for the flower on top. 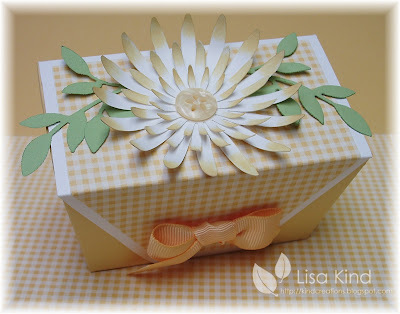 I used the daisy die cut from SU and sponged some so saffron ink on the edges of each petal. I curled the ends for more interest. The leaves are also a SU die in certainly celery. The button is PTI. I would just love to receive this full of candy...wouldn't you? These templates are so fun to make and so pretty to give and receive! 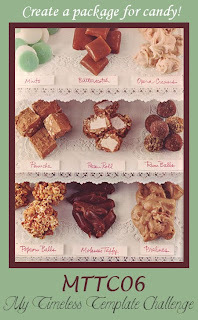 Now you must stop by the blogs of the My Time DT to see their candy packages. They never disappoint. If you decide to play our challenge, please post your direct link to Mr. Linky on Lauren's blog. 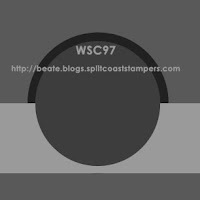 If you post to SCS please use the keyword MTTC06. Thanks for stopping by today. I hope you enjoy your weekend! 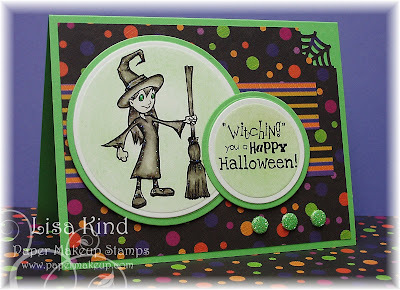 I have a Halloween card to share today from Artful INKables. It's their newest release called Halloween Hauntings...11 great images and sentiments for all kinds of great Halloween creations! 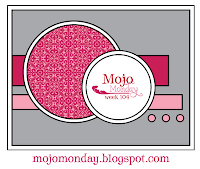 I saw this great layout on the Mojo Monday blog this week...there are some fabulous ones on that blog! So I had to use it and had intended to do a black and white card, but that little bit of bright pink showed up in the ribbon, so I went with it! It sort of pumped it up! I used a 1 3/8" punch for the circles and used SU's new paper called Night & Day. And I of course used that great MS drippy goo punch! What fun that is! 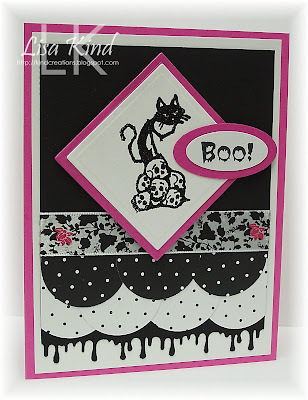 I stamped the cat and skulls image in Versamark and heat embossed it with Starry Night embossing powder. I really sparkles...something I really like on my cards. I added the "Boo" sentiment from the set, and when I took a good look at it, it's drippy-looking like the drippy goo punch! That's all for today, folks! I had Open House tonight and was at school all day...needless to say I'm falling asleep as I'm writing this! I hope you check out the Artful INKables store (it's had a recent overhaul and you should check it out and all the fun things there). Thanks for stopping by! Paper Makeup Stamps' Monday Challenge this week was to use punches or die cuts. Tangii came up with this idea, and I'm glad she did because it got me to use a couple of these die cuts I've had from SU forever! I think I may use them more now that I've finally pulled them out! I'm in an autumn mode...can you tell? This is my favorite time of year! We had a BEAUTIFUL fall weekend this past weekend and I was just lovin' it! (Perfect for football too...and the Bills won, Christi!!) Anyway onto the card. I used the PMS Swirlie Tree image and colored it with SU markers in chocolate chip, old olive, really rust, and only orange. I like how the tree trunk looks...it sort of came out like a real one. The dp is also a retired SU one called Autumn Vine. I paired it with pumpkin pie and chocolate chip. 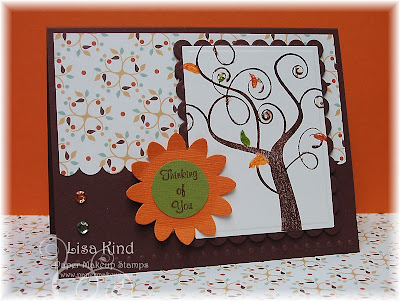 The sentiment on the old olive circle (also a die cut) is a PMS one stamped in chocolate chip. I added embossed dots on the bottom of the card, some bling, and some star dust stickles on the tree. The sketch is Beate's weekend sketch from this past weekend. I just changed the orientation a bit because of the way the tree was "swaying"! You still have time to play in our Getting Punchy PMS Monday Challenge by posting your direct link to Mr. Linky on the PMS blog. You should stop by anyway and see the fabulous creations the DT created for this challenge! 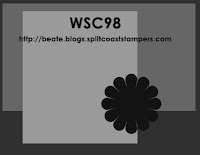 If you post to SCS/PCP, use the keyword PMSMC28 and Paper Makeup Stamps so we can find it. Thanks for stopping by! PMS Monday Challenge on Friday! I'm doing the Paper Makeup Stamps Monday Challenge on Friday! The challenge was issued by Jamie Morris and she wanted us to make a flap card. 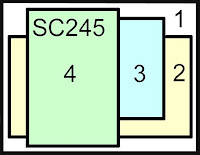 The directions in the SCS Resources gallery are so easy to follow and they are really fun to make! 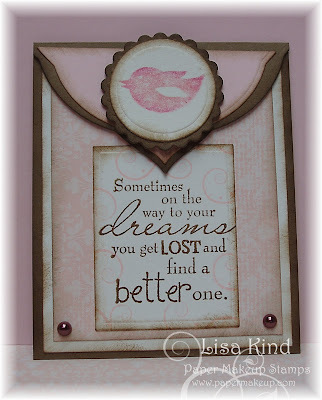 I used PMS stamps from two sets: Dream Big (the swirls) and Nature's Song (the bird). The wordart on the outside and sentiment inside are separate stamps. I got my color combo from the SCS color challenge: soft suede, pink pirouette (it was supposed to be pretty in pink, but I liked pink pirouette better), and white. I distressed all the layers with soft suede. The bird was colored with watercolor crayons, spritzed with water, and stamped on watercolor paper. 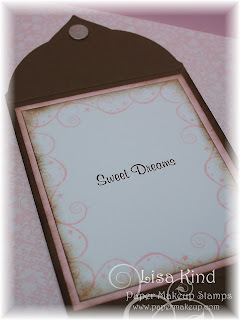 I used one of the newer nesties for the flap of the card and mounted the pink paper on top of it using the same nestie. 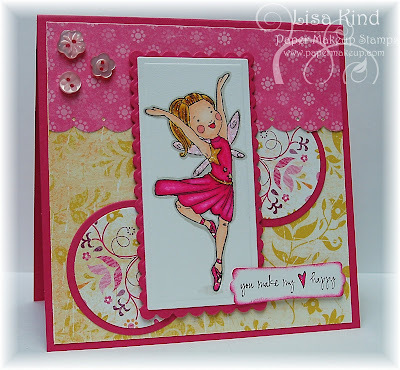 I used the swirls from the Dream Big set stamped in pink pirouette on the wordart and on the inside. I added the brown pearls on the bottom. The flap is held shut with a Basic Grey magnet. These are so fun to make and a nice change from the normal card. If you play, you can post your direct link to Mr. Linky on the PMS blog. If you post to SCS/PCP, please use the keyword PMSMC27. Also, today is Friday, so it's also Freebie Friday at PMS. You can snag a free digital wordart for a week, then it's gone. So stop by the PMS blog for your free gift! Thanks for stopping by and have a great weekend! 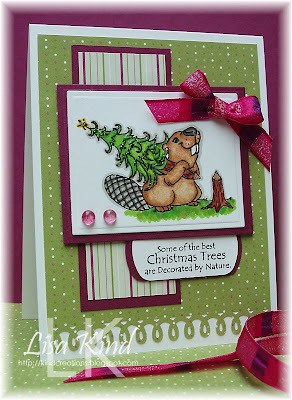 I decided to use another beaver from the new release called Holiday Treats & Tails. I think this guy is my favorite of the three different beaver images in this set, although I really love them all! I used the Taylored Expression sketch from this week and SU's retired Ski Slope dp. The ribbons are SU also. I added crystal effects to the bulbs to make them look real. I ran the red mat through a snowflake cuttlebug folder for texture. To add more texture, I put liquid applique on the beaver's hat to make it look like fur. 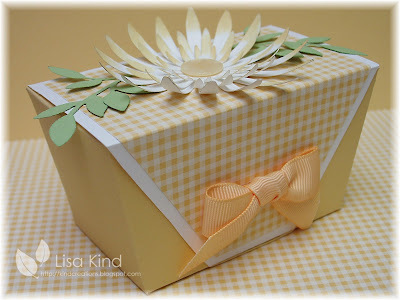 If you want to play in this challenge, link your direct post to Mr. Linky on the Artful INKables blog. Remember...you don't have to use AI stamps, but if you do you can enter your creation twice for twice the chance to win a grab bag of AI stamps! You have until Tuesday, September 29 to enter. If you post to SCS/PCP, please use the keyword AIC03. Thanks for stopping by! Welcome to the Paper Makeup Stamps Monster Hop!! Are you afraid of monsters? Well, don't fret...ours are friendly ones! PMS had some late releases of some of our monsters that weren't available for our September release...I think they were taking their time finalizing their Halloween costumes! LOL!! I hope you are enjoying this PMS Monster Hop so far! You should have arrived from Christi's blog. If not, then please hop over to the PMS blog and start there to see all the little monsters. I have this cute little witch to give you the "evil eye". Can you see her evil green eyes? I wanted this card to be a black and white card. Katie did this fabulous tutorial on coloring images in black and white with copic markers, and I started out on that route. But, as you can see, I added some fun color. The sketch is yesterday's Mojo Monday sketch. I was hoping I could get my card to work into this sketch, and it worked perfectly! 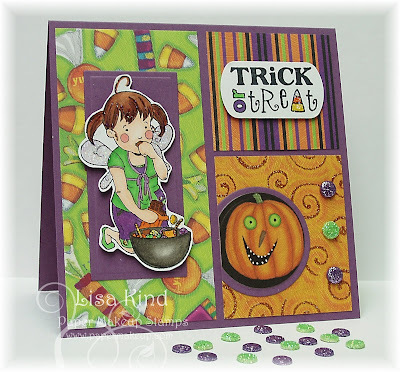 I used K&Company's Halloween stack...the colors are so vibrant, and it matched great with SU's green galore. I used a MS spiderweb punch in the corner, and gave the background on the witch and sentiment some color with a soft brush. (I'm still thinking of the copic airbrush system...maybe Santa will bring it for me!) I added the glitter dots and star dust stickles to the witch. Now continue the hop by visiting Tangii's blog. She always has something fabulous to share, and I'm sure her Halloween Monster will make you smile! And don't forget to post a comment on all the DT blogs...one blog is the "mystery blog" that will be giving away the entire Monster set! Your comment may be the one chosen to win! Enjoy the rest of your hop and thanks for stopping by today! Artful INKables Blog Hop and Release Day! Happy Monday everyone! Are you having fun on the Artful INKables blog hop? You should have arrived here from Crystal's blog and seen her great Halloween creation! If not, hop over to the AI blog and start there! We have two new sets being released today that you won't want to miss out on! Crystal showed you a card made from Halloween Hauntings and I'm going to show you one from a super cute Christmas set called Holiday Treats and Tails. I've never seen a beaver associated with Christmas, but I'm over the top for this one! Here's my card. Isn't he just the cutest little thing? There are two other beaver images that are equally as cute. Hopefully you'll see them on the hop, if you haven't already! This whole card started with this ribbon that is new to the AI store. Kristin gave each of us some of it to use, and it dictated my color choice. I used SU's Cottage Wall and Rich Razzleberry cardstock. The sketch is from SCS this week. I just flipped it to accommodate my image. Mr. Beaver is colored with copics and I added star dust stickles to the tree and yellow stickles to the star. I just got this Martha Stewart loop punch and LOVE IT!! Doesn't it just look so pretty on the bottom? So glad I was able to get that one! So to continue with the hop, please go to Emily's blog and see what she has to wow you! You have the chance to win some AI blog candy, so make sure you finish the hop! Thanks for stopping in today, and have a great week! I have some Thanksgiving cards (yes, that's right, Thanksgiving!) to share with you. They are from Anna Wight's August release for Whipper Snapper and this one is called Turkey Time. I remember the thing I liked most about this one was the dog! I love dogs, so that's not surprising, but I just love that Anna drew a pilgrim collar on him! So cute! I used Jen del Muro's sketch for this card. I just loved this sketch! The chocolate chip squares and circle were run through the swirls folder. I colored the images with copic markers and the little dog was cut out and popped up on dimensionals. He's so sweet! 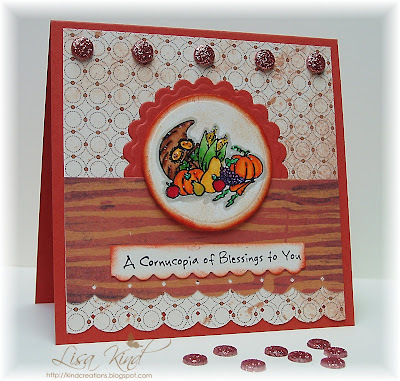 The dp is PTI's Autumn Abundance and I also used SU's new Dusty Durango cardstock and ribbon. I added gold to the buckles on the boy pilgrim with a Spica glitter pen. The next card is a smaller 4.25" square. I wanted the cornucopia image to be the focal point, and it was too small to put on a larger card, so I just made it smaller! 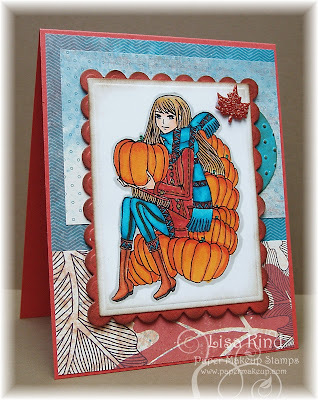 The dp on this card is from SU's Holiday Mini catalog and it's called Autumn Meadows. It has some really fabulous fall prints in it. I scalloped the edges with a border punch, and used scallop scissors for the sentiment. I added those fabulous glitter dots...I was lucky and had these copper colored ones. 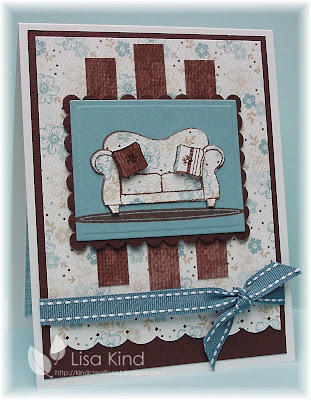 This card was done using Beate's Weekend Sketch. I don't know what I would do without all these wonderful ladies out there creating these sketches for me! I'm definitely sketch-challenged! Thanks for staying with me for these two cards. I hope we're not rushing the holidays...but it's always great to get ahead! I'm going to have a Christmas card for you tomorrow, so watch for that one! We're having a blog hop for the Artful INKables new releases! Please join us for that! 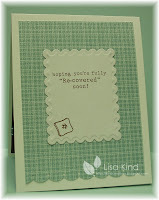 And I'll have another blog hop for you on Tuesday from Paper Makeup Stamps. I'm issuing a warning now...it's going to be a monster hop, so be prepared! LOL!! Don't forget to stop by the Whipper Snapper Feature Designers gallery on SCS to see all the cards the other guest designers have done with Anna's new releases! See you tomorrow! So today is Saturday and it's time for the My Time challenge. This week's challenge is an inspiration challenge, and it's being hosted by Kristin. This is the inspiration piece Lauren gave us. So I was inspired by two things: the colors (love blue and brown) and the pillows. I immediately thought of PTI's set On My Couch. So this is what I came up with. I started with the Mojo Monday sketch for this month (I just realized my stripes should have been bigger...ugghhh!) and this retired paper from SU called Parisian Breeze. I chose the floral for the couch and background because of the floral pattern in the inspiration piece. I paper pieced the couch and stamped the pillows on the dp as well. The pillows are popped up on the couch for dimension. The scalloped border on the bottom is an EK Success punch (the ones that fold flat...love those). I seemed to have lost my mojo on this one...it just looks so plain or something to me! Maybe it's because I didn't use one copic marker or any **sparkle** on it! I think those two things are becoming my signature style! 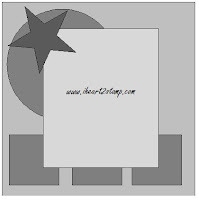 If you want more inspiration, please stop by the blogs of the My Time DT. Here are the links. If you play, please post your direct link to Mr. Linky on Kristin's blog. Your card may be chosen as one of five My Time to Shine cards! If you upload to SCS, please use the keyword MTTI06 so we can find it. Thanks for stopping by! I can't believe I didn't post these this week! You can tell I'm otherwise engaged....school started and I'm back at work teaching for my 12th year! You would think it gets easier, but it doesn't! I had to move to a new room (I'm not complaining...it's a much bigger room), so I was there for 2 weeks before school started unpacking and setting things up the way I want it. I hope I don't have to move again! What a pain! Anyway, on to the cards! I should have posted these earlier, but never got to it! The first challenge is a CASE of PMS. We were to CASE a card in the PMS gallery. I chose this card by mom2kjs. I just loved her layout. Here's what I did with it. I used one of the new Moody Girls stamps called Moody for Coffee that was released by Paper Makeup Stamps on Monday. Isn't this a beautiful image? I wasn't too crazy about these Moody Girls when Katie first showed them to the DT, but I have to admit that I am in love with them! They are so fun to color and are so different from other images out there! I used some new SU paper called Cottage Wall. Such pretty, rich colors! The second challenge is the Paper Makeup "recipe" challenge. The foundation is this sketch. Then for the "powder" use some sparkle (glitter, stickles, etc. 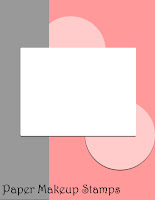 ), for the "eyes" use buttons, for "blush" incorporate pink into the card, and for the "lips" use at least three layers. Here's my recipe challenge card. As you can see, I flipped the sketch. I used this pretty new fairy called Marissa. The sentiment is also from PMS. The dp is SU's Razzleberry Lemonade. I love these colors, too! This card is 5.25" square. If you want to play in the challenge, you have until tomorrow, Saturday, September 12 to enter. 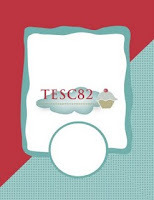 Just upload your card to SCS/PCP and use the key words Paper Makeup Stamps and PMSRP14 for the CASE of PMS challenge and PMSRP15 for the recipe challenge. Thanks for stopping in today! Before I begin, I'd like to wish all of you a happy Labor Day! Enjoy your day! Today's the day for the new Paper Makeup Stamps release and blog hop! You should have arrived from Tina Hale's blog. If not, please go to the PMS blog and start there to get your information. You will be picking up letters along the blog hop which will give you a code to receive 15% off the new releases! Katie and Shaela also have a surprise goodie along the hop (which I don't even know about), so be on the look-out for that! So let's continue with the hop! I've used a new fairy called Candy along with a new Halloween sentiment. (There are three other Halloween sentiments being released as well.) Isn't she so cute? She looks to me like she's sneaking the Halloween candy from the bowl! She's colored with copics and I added star dust stickles to her wings and hair. 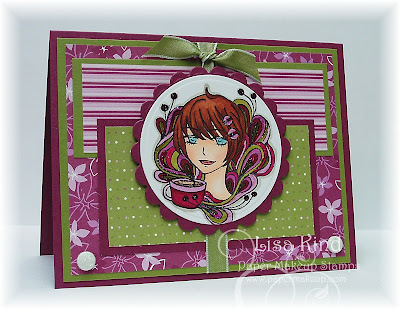 The sketch is from Beate's weekend sketch challenge, and it's a 5.25" square card. The dp is from a K & Company Halloween stack. The pumpkin is from this pack as well. I just cut it out with a circle nestie. I also added those fabulous glitter dots for more sparkle! I just love this card and all these great colors! Perfect for this cute little Candy fairy! Now, my letter for you is "S". Your next stop on the PMS blog hop is the very talented Shaela Odd. I'm sure she has something fantastic for you (the DT has kept their cards a secret so that we can hop and see everyone's cards just like you are doing!). And don't forget to join us tonight at the Release Party in the PMS forum at 9:00 CST! Thanks for stopping by and happy hopping! 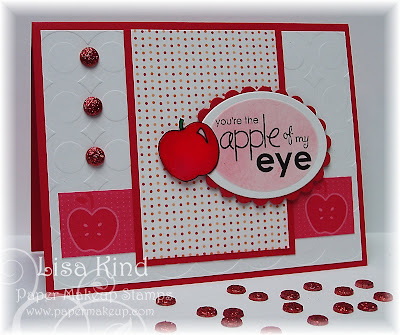 I have another great new set to preview for you from Paper Makeup Stamps called Apples to Apples. Being a teacher, this was the perfect stamp set for me! Our DT member and designer, Shaela Odd, designed this set. She mentioned that she created it for the apples because she couldn't find a set that had good apple stamps. There are a total of six different apples in this set along with three great quotes. I used the traditional apple here and paired it with SU's retired summer picnic dp. The white background was embossed with a Quick Kutz die. I added the red glitter dots to fill up the white space. The apple quote was given some color with a soft brush and real red ink while still in the nestie die. You can't really tell in the picture, but the apple is covered in crystal effects to make it shine like a real one. 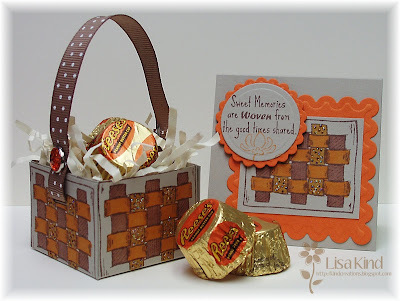 Our PMS DT has some other samples to share with you on the PMS blog. If you leave a comment on the PMS blog, you could win this entire set! Good luck! Thanks for stopping in today. Have a great weekend! Hi everyone! 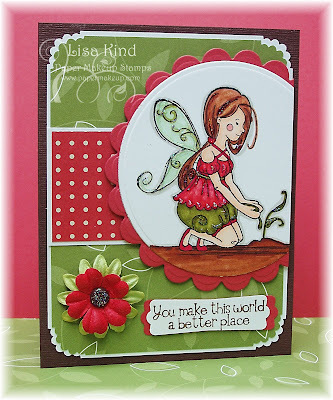 Did you happen to see the latest Think INK Tuesday challenge over on the Artful INKables blog? Holly challenged us to make a box or bag. I searched the Resources section on SCS to find something I hadn't made before and decided on the Tiny Treat Basket. One of the stamps from AI's new set, called Fun and Friendly, has a woven pattern that fit perfectly right on the side of this tiny basket, so I went with it! I had to find some candy to fit inside (it had to be small, because this really is a tiny basket). I went to my corner gas station to find something, and these miniature Reese cups were it! They happen to be my favorite candy, too! I was inspired to color the weave pattern by the colors of the wrapper. I added some stickles to bling it up. The handle is SU's new in color swiss dot ribbon in soft suede. I attached it with a shimmery orange crystal brad. I had to make a little 3x3 notecard with it because I loved the sentiment. I stamped the little flower in pumpkin pie (it's stamped off first to get the lighter shade). Both the sentiment and flower are alsofrom the same set. You can enter this challenge on the AI blog by posting your direct post to Mr. Linky. If you post to SCS or PCP, please use the keyword AIC02. You could win a grab bag of AI stamps! You have until Monday, September 14 to enter...that's a lot of time to make something fabulous! You don't need AI stamps to play, but if you do use them, you'll get to post your entry twice...which means more chances to win! ;-) I can't wait to see what you come up with! Thanks for stopping by! Today is Day 2 of the Paper Makeup Stamps sneak peeks. I didn't get one done yesterday, but you can see what the others have done on the PMS blog. They previewed the sentiment set called Spooky Sentiments. Today we are previewing a new line called Moody Girls. I LOVE them! They seem intimidating, but they aren't! They are so fun to color. Isn't this a cool image? There are three other Moody Girls being released this month that are just as fabulous. I wanted to use this one because I love all things autumn, and I loved the pumpkins. I chose my dp first, then colored her accordingly. I used SU's new dp from their mini catalog called Autumn Meadows. It's really fabulous! So many pretty papers! I also used this week's sketch from Jen del Muro. If you want to see more, go to the PMS blog to see samples done by the DT. You are going to be wowed! Stop by again this week for more PMS sneak peeks. The release party will be Monday, September 7. More info to be announced later. Have a great day!